If you are not in hurry, please send us your inquiry through our Web Form. We can answer to your queries at the earliest. You can send emails from "Contact Us" for technical-related questions. Our technical experts will answer to you A.S.A.P. We appreciate if you could inform us how you are using the sensor in what environment, so that we can also give you more detailed answers. We usually send you Quotations within 2-3 working days. Please refer the right column "METROL BUSINESS DAYS". Is there branch offices in U.S.A? We don’t have any Branch Office in the U.S.A, but there are our Distributors in countries listed below. Can I contact you via emails? Yes, but please note that inquiries from Web Form is faster and smoother than emails. Please send us inquiry from Web Form. Thank you for your cooperation. I want to order Tool Setters for 5 Qty. Is there any discount? Yes, you will get some discount if you order more than 5 Qty for the same Tool Setters. Please request details by Quotation Form. I want to order Tool Setters for 3 Qty and switches for 10 Qty. Is there any discount? We are afraid that discount is applicable only when your order is more than 5 Qty of the same Tool Setters. Switches are not applicable to any discount. Will the price remain the same if it is within one year? Quoted Price is valied to 30 days from the date of Quotation. Please note that the price may change without prior notifications. Kindly request us for updated Quotation even you are a repeat customer. Can I pay in U.S. Dollar? We are afraid that we accept JPY only. U.S. Dollar, Euro or any other currencies are not acceptable. I want to know how much it will be in my own currency. You can convert JPY price to your own currency on the website below. Please note that the exchange rate may be subjected to change when you make a payment. Yes, shopping at our toolsensor.com is safe and secure. We are using ZEUS Corporation online payment system and all the information is encrypted and transmitted through SSL Protocol for safety. Error occurs when I pay by a credit card. Most of the credit card errors are due to the expiry date or credit card limit of your card. We are afraid that we cannot inquire about your private information to your credit card company. Kindly contact to your credit card company by your end. It is difficult to pay in advance payment in JPY. Is there any other option for payment? We have our Distributors in the countries listed below. We can also introduce you our Distributors so that you can contact them for another payment option so that you can contact them accordingly. If your company is in India, our Indian Branch Office will be happy to support you. I made a mistake on credit amount. We are afraid that we cannot ship the item if there is a payment shortage. We are afraid that we don’t accept any cheque or International postal money orders. Please do not post us any cash. What does it mean by JPY 45,000? (JPY doesn’t notate after the decimal point). Can I purchse as an individual not as a company? Yes, even individuals can also purchse. The product number is not listed in the Website. Can I still order the product? You can request for Quotation with your product number even if it is not listed. Please note that our Authorized Distributor will be your corresponding to any inquiries/orders from China, Taiwan, Korea, Hongkong/Macau. I want to order from Shopping cart, but my country is not listed in Delivery Country. If your country is not listed in the Delivery Country, transaction cannot be done through Shopping cart. Kindly send us a Quotation request via Quotation Form. Can I also order Tool Setters and sensors that are not Metrol make? We sell only Metrol make products. Some of the products that are compatible with other manufactures are also available below. I made a wrong order. Can I cancell my order even after the payment? I want to order for spare parts for broken sensors. How can I find the product number or serial number? Product numbers can be found in the nameplate on products. If the product number in the nameplate is not visible, kindly describe features of your product which may help us to identify the product. * Size, Diameter, or Pitch of Products. * Connector type or Cable lengths. * Name of Machine manufactures or models. Can I order just a Sensor Head? Yes, if the product number contains options, such as Extension Cable or Polarity Converter Unit as a set, you can put as "Sensor head only" when requesting. Usually you can identify by refering the last characters of product numbers for such. Set items can be found in the technical drawing. 1) Last character having H/AH/CH in product number doesn't include Extension Cable or Polarity Converter Unit. It contains Sensor head only. 2) Last character having S/A/C in product number contains options, such as Extension Cable or Polarity Converter Unit. We are afraid that we cannot reduce the lead time, as almost all the products are make-to-order. However, we may able to reduce the lead time depending on the situations mentioned by you. Is my personal information secured at toolsensor.com? Yes, we highly value your privacy at toolsensor.com. Toolsensor.com does not provide any of your personal information to third parties. Any personal information required at toolsensor.com will be limited to our internal use only to process your order and improve the service. Furthermore, we do not collect unnecessary personal information unless it is provided by you. Where can I receive any campaign information? We have some promotional champaign irregularly in our facebook page. Who is the Freight Forwarder? Both UPS and DHL are available as International Freight Forwarders. Regular mail cannot be used as the sensors are highly sensitive to the damage. In case you have some problems in receiving, please contact us in advance and we may be able to coordinate with your own freight forwarder. How much is the Freight Charge for H4A-53-01H for 1 Qty? The Freight Charge varies in shipping countries and quantities. Please request for Quotation for further details. I cannot track my parcel online. There is some time lag in tracking your parcel. Please try it on the next day. What is the size of parcel? The size of parcel varies in products and quantities. What is the lead time for H4A-18-34 for 1 Qty? Approximate lead time for H4A-18-34 (1 Qty) is around 2 working weeks after confirming the payment. Kindly note that lead time varies depending on the quantities and time. Large orders for some special customized products some times take more than 2 months. How many days for shipping to Chicago, U.S.A? Shipping days from Japan to Chicago, U.S.A is around 3 to 7 days. Kindly note that shipping days vary depending on the quantities, time, and custom clearance. It may take even 1 to 2 weeks for custom clearance. Can I receive the order P.O. Box? We are afraid that our sensors are highly sensitive to the damage and thus, cannot ship the parcel to your P.O. Box. In case you have some problems in receiving, please consult with us in advance and we may able to coordinate with your own freight forwarder. Yes. But changing your shipping information may result in some handling charges after shipment. Kindly send us your new shipping address via email with your Reference Order number as soon as possible. Can I pay for Cash on Delivery by my own Freight Forwarder? We are afraid that you cannot choose your own Freight Forwarder. What happen if the item broke during the delivery? Kindly inform us immediately if the item is broken during the delivery. We will ship a new product A.S.A.P. We are afraid that you cannot return the item unless there is a mistake at Metrol side. Kindly inform us immediately if you receive a wrong item mistaken by Metrol. Yet, we are afraid that we cannot accept any return or replace of products if it is a mistake at your side. Please confirm the exact product number before placing the order. Is there a installation manual available? We are afraid that there is no specified mannual for installation. You can refer to our Catalog for basic installation and cautions. Do you provide any installation service? We are afraid that Metrol doesn’t provide Installation service except in some ASEAN Countries. Kindly send us inquiry for Tool Setter installation service in ASEAN countries. Do you sell any Sensor Arms for Tool Setters? We are afraid that Metrol doesn’t provide Sensor Arms. Please consult with your machine builder for purchasing or installing Sensor Arms. Please note that it will be out of warranty after above period is over even unopened. Can I order and customize Tool Setters? Yes, we can customize the cable length and contact surface etc on your request. For further details, please make inquiries from below. Can you repair Tool Setters? In case the sensor cannot be repaired or you feel the repair estimate is too high at your side, we will ship the sensor back or dispose of it on your request. Do you sell Mazak Tool Eyes? Yes, Tool Eye and Tool Setter is the same product. Mazak calls Metrol Tool Setters as, "Tool Eye". What is the difference between Q-Setters and Tool Setters? Q-Setters and Tool Setters are the same product. Some Machine builders call Metrol Tool Setters, "Q-Setters" as nickname. I purchased Tool Setters in the U.S., but accuracy is not good. There are many "imitation" Tool Setters of Metrol in the U.S. and most of them are either "Made in U.S.A" or "Made in Korea". Please make sure of Metrol Logo when purchasing. All the Metrol products are "Made in Japan". What is the main difference between Metrol Tool Setters for Lathes and others? Metrol is a pioneer in Tool Setters for CNC Lathes. When we launched the first Tool Setters in 1983, all the Machine tool builders in Japan adopted Metrol Tool Setters. Nowadays, other Tool Setters for CNC Lathes in the world are made based upon Metrol Tool Setters. Metrol was awarded the prestigious prize for "Science and Technology" in Japan. Is Marposs one of the Metrol Brands? Yes, Marposs make Tool Setters A90 series are OEMed by Metrol. Please refer to the Compatible List for the same products. Is OMRON one of the Metrol Brands? No, OMRON make D5F series and Metrol Tool Setters are different products. Yet, you can order the products which can be replaced with the Metrol Tool Setters. Is AZUMA one of the Metrol Brands? 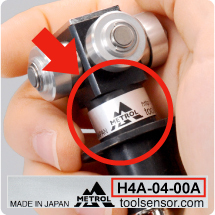 No, AZUMA make Tool Setters are not Metrol brand. AZUMA is one of the imitation Made in Japan products. Is E-SUNG one of the Metrol Brands? No, E-SUNG make Tool Setters but are not Metrol brand. E-SUNG is one of the imitation Made in Korea Products. What is the difference between Metrol Tool Setters for Maching Centers and others? Metrol Tool Setters for Machining Centers are plunger-type. Plunger-type is more durable to the harsh environment than Laser-type and more accurate than Swing-type. Famous Machine builders in Japan (ie Mazak, Mori-seiki, Makino, Okuma, and Yasuda etc) have adopted Metrol Tool Setters and Metrol has the largest market share for contact-type Tool Setters in the world. Where do you manufacture Tool Setters? We are afraid that we don't have any showroom. Is Metrol "ISO" certified company? No, Metrol no longer maintains "ISO". We used to obtain "ISO 9001" previously, however, we decided to improve our Customer Service and Support rather than maintaining the cost time and money for ISO. Nowadays, other Tool Setters in the world are made based upon Metrol Tool Setters. Is "CE Marking" applicable to Metrol products? 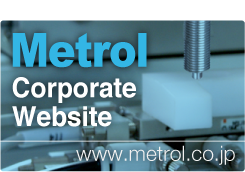 Metrol sensors are not applicable to CE Mark, Machine Directives and Low Voltage Directives. Exporting the product to Europe is no problem.